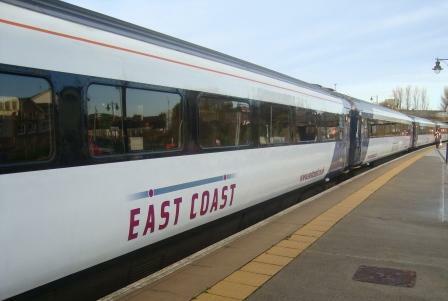 Standard Class travel on East Coast trains is definitely one of the nicest forms of standard class I have experienced on long distance journeys with 15 minutes of free wifi included, a cafe-bar on board and power sockets at most seats. When you are ready to upgrade to First Class though, the level of service changes and you can expect a lot more. The first difference you will notice when stepping into first class is the different layout and generally how much quieter is it. This is perhaps due to the fact that there is usually only a few people in first class at any one time and that generally people there are more respectful than those who simply pile onto a carriage in standard class (I think this ia a fair enough comment considering I am in standard class 95% of the time). The rows are 2 by 1 seats, instead of 2 by 2 seats, meaning there are only 3 seats per row and each seat is substantially wider. The seats also slide downwards to give the effect of leaning back slightly but without inconveniencing other passengers behind you. Due to how few passengers there were on the service, I was able to move from one of the individual seats to having 4 for myself around a table. Speaking of tables, this is perhaps the best benefit of first class: complimentary food. During the weekends it is a rather paltry sandwich, crisps and a slice of cake which were fine although the only options were egg and cress or ham and cheese - I opted for the latter then spent the best part of 10 minutes removing the cheese. However during the week at lunch and dinner times you get a full meal. I opted for the salmon fishcake and chips which arrived in under 5 minutes from ordering. It was absolutely fantastic and although the portion was small it managed to satisfy me with the rich sauce inside the fishcake and there were just enough chips to compliment this. As well as this I was offered crisps, a slice of madeira cake and a drink: I opted for a coke. Altogether this made for a satisfying meal which also helped the 2 hr 30m journey fly by. During the weekday service I was also offered a complimentary newspaper but opted to stick with the 'guardian' which I had already purchased beforehand. On both week and week-end services you are also offered tea or coffee multiple times and you can always request a glass or bottle of water which the staff are happy to bring to you. In addition, in first class you have unlimited free wifi for the duration of your journey which is a nice perk too. All this comes at a cost however, the cheapest first class fare from London to Leeds (or vise versa) is in theory £14.50 though I've never actually seen these on sale. The cheapest I have managed to get a first class fare with about £20 is 2011 and in 2012 I have purchased one for £26.10. All the aforementioned prices are based on a railcard discount of 34%. Whether this is worth it very much depends on the price of the standard class ticket which can vary from £8.60 to £21. I would say personally the hot food is what makes the extra price worth it so I would personally only upgrade on weekdays. The upgrade from the cheapest standard ticket [£8.60] to the cheapest first class [£26.10] of £17.50 is a bit too much for me personally. But if the difference is of only £7-£10 I would definitely consider it. The price of a couple of sandwiches, crisps and a drink to take on to the train is usually about £5-6 plus wifi is about £5 for a train journey too. The quieter atmosphere and the service is also worth a bit extra. So an extra £7-10 for first class seems worth it in these circumstances. Conclusion: First Class is not something I'd take each and every time due to the price but it a nice treat every once in a while. The service itself cannot be faulted, particularly on weekdays.